Stanford Law School Professor George Triantis, chair of the Stanford Cybersecurity Initiative’s steering committee, opened by discussing the unique role and position that Stanford has to play in terms of cybersecurity. “Stanford has been birthplace of many of the great tech advances in computing and network innovation,” Triantis said. 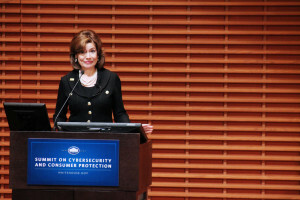 Maria Contreras-Sweet, the administrator of the U.S. Small Business Administration, followed Triantis with remarks on the subject and the event. Addressing the large crowd in the Graduate School of Business’ CEMEX Auditorium, she opened with a reference to the event’s date: Friday the 13th. Contreras-Sweet discussed several programs run by the U.S. Small Business Association, and explained that in addition to providing capital assistance in the form of loans to small businesses, it works with partners across the country to counsel small business owners through several executive volunteering programs. She also spoke about the related Small Business Innovation Research Program, which represents the largest angel investment fund in the world. “I would like to see more Californians apply for this fund,” she said while talking about innovation in Silicon Valley. The fund is launching a roadshow across the country next week. Chip-and-pin systems use a combination of a digital chip and a personal identification number on all credit cards, providing an additional layer of security and fraud protection. She emphasized how much the transition would affect small business owners who did not comply with the new payment regulations. The dangers for small businesses exposed to this kind of liability are severe. More than 180 million Americans carry a credit card today, with most carrying up to three. Last year, credit card fraud totaled $7 billion of liability on consumers and payment companies. “We need to empower small businesses to improve their technology and protect the consumer,” she said. “Every entrepreneur and consumer needs to be aware of this — if they don’t upgrade their technology, on that day they will be liable for fraud. The program has several industry partners, including Square, American Express, Visa and MasterCard. “Our message is that they must take care of their customer’s personal financial data as though it were their own,” Contreras-Sweet concluded. The issues related to this transition were addressed by Deputy Secretary of the Treasury Sarah Bloom Raskin. “Is cost going to interfere in adoption of new technologies?” Raskin asked. One of the many solutions to issues in the payment space came later on in the panel, when PayPal CEO Dan Schulman spoke as part of a panel. Schulman talked about the advantages of non-traditional payment systems, such as PayPal’s anonymous and relatively safe token-based process. Tokenization — which PayPal has used for 15 years — allows for two parties in a financial transaction to an alias instead of directly communicating with each other.